Tag line: "He's mad, he's bad, and he's Bustin' Loose!" 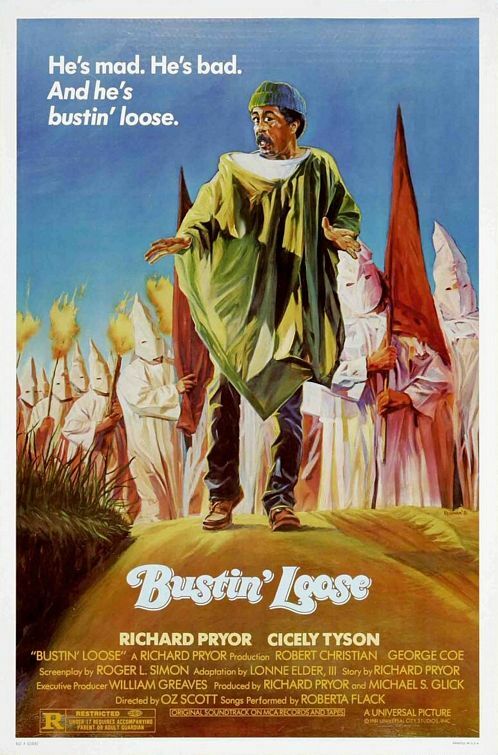 Though not his best film, 1981’s Bustin’ Loose gave comedian Richard Pryor (who also helped with the story) ample opportunity to strut his stuff, and that alone is reason enough to see it. After violating his probation, ex-con Joe Braxton (Pryor) is remanded to the custody of his parole officer, Donald (Robert Christian), who asks him for a favor. It seems Donald’s fiancé, school teacher Vivian Perry (Cecily Tyson) is planning to take a group of special-needs children to live at her Aunt’s farm, and needs someone to drive them there. So, Braxton “volunteers” to shuttle Vivian and the kids from Philadelphia to Seattle, Washington aboard a rickety old school bus. Though uncomfortable at first, Braxton soon warms up to the kids, and even helps them with some of their problems. They eventually make it to Washington, only to learn that the bank is about to foreclose on Vivian’s aunt’s farm unless she can come up with $15,000 in a hurry. Can Braxton raise the money, or will the kids be left out in the cold, with no place to call home? Bustin’ Loose gets a bit too sentimental at times, especially late in the film, when Braxton is “bonding” with the kids. Thankfully, though, the first half of the movie more than makes up for it. I love the scene towards the beginning where a fast-talking Braxton, posing as one of their employees, almost walks out of a warehouse with 75 television sets, only to be undermined by his nervous partner, Marvin (Paul Marvin). The give-and-take he has with some of the kids early on is also funny (at one point, he even threatens them with a switchblade). The most famous sequence in Bustin’ Loose is undoubtedly the one where Pryor tricks the Ku Klux Klan into helping him push the bus out of some mud (getting their white robes dirty in the process), but just before the KKK shows up, we get a moment that’s classic Pryor, in which a pissed-off Braxton, walking alone in the rain, unleashes a slew of hilarious expletives, earning the film its R rating. Aside from being funny as hell, this scene (and a few others besides) serves as a reminder of why Richard Pryor was considered one of the finest comedic talents of his generation.